Rescue efforts continue at the site of the catastrophic landslide near Oso, Wash., north of Seattle. The death toll was most recently confirmed at 16, with eight more people found but not recovered, and an estimated 90 missing. The Seattle Times has been investigating the known risks of that location following a smaller mudslide in 2006. The Everett Herald has been reporting nonstop, from the rescuers to the residents who just barely escaped. For those of us who’ve never been there, it’s hard to grasp the area of devastation the community is dealing with. For a rough comparison, here is the mudslide area at the same scale as downtown Spokane — picture rescue efforts covering an area larger than Riverfront Park. Look below for ways to help. 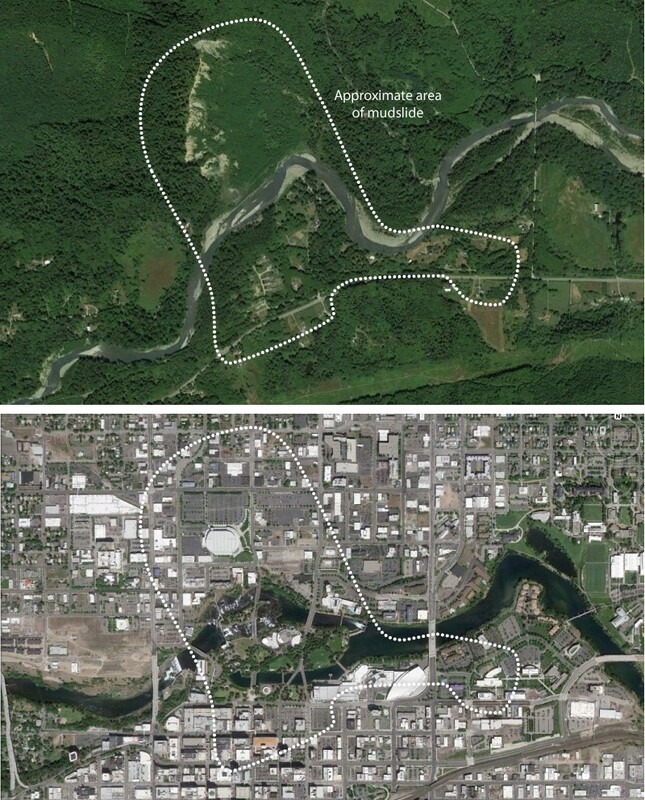 Top: The approximate area of the mudslide near Oso, Wash. Bottom: The area's size compared to downtown Spokane. Like with most natural disasters, cash is almost certainly the most effective way you can help. Many aid organizations find themselves overwhelmed with donations of clothes or toys when what they really need is money to most efficiently get help on the ground. As always, be cautious when choosing your charity; more tips on that here. The American Red Cross says it has nearly 100 workers in the area providing food, supplies and shelter for affected families and first responders. The group says it has plenty of volunteers and supplies, but is in need of financial help. To donate, click here, call 1-800-RED-CROSS or text REDCROSS to 90999 to make a $10 donation. The United Way of Snohomish County began its Disaster Recovery Fund for Mudslide Relief with $25,000 from its endowment and a $50,000 gift from JPMorgan Chase. Donate here. The Washington State Combined Fund Drive, which normally collects charitable donations from state employees, is now accepting public donations to help those affected by the mudslide. Donations to the fund will benefit the American Red Cross, the Snohomish County Volunteer Search and Rescue Unit, the WSDOT Memorial Foundation and The Soup Ladies, a group that's been providing food to those searching for survivors. Donate here. Cascade Valley Hospital in Arlington has started a disaster relief fund and describes in this way: "All monies raised will go directly to those in our community affected by this event. We will be coordinating with recognized community organizations in the Oso/Darrington area to pinpoint what their specific needs are, and distribute funds through those organizations." Donate here. For Westsiders, The Coastal Community Bank is accepting donations for slide victims at all branches (Darrington, Camano Island, Everett, Monroe, Stanwood, Sultan, Silver Lake, Smokey Point, Snohomish and Whidbey Island) and a list of benefit events is here. Keep up with relief efforts in the area here.